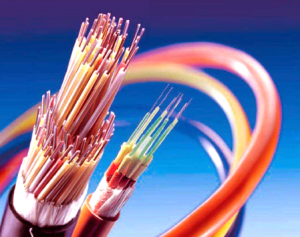 Fiber Optics are flexible, transparent fibers made of glass or plastic. These fibers are only slightly thicker than a hair but permit transmissions at higher bandwidths and over longer distances than those of wire cables. Fibers are more resistant to signal loss which can often occur with metal wires. The electromagnetic interference that often plagues metal wires is a non issue when it comes to fibers. Fiber Optics allow fiber-dependent communication such as internet, phone, and television to be more reliable and faster. Fiber Optics will also last longer and withstand weather better than other types of wires and cables, so that makes Fiber Optics an asset and economical advantage to the modern day business and home.